I've use unity on both a smaller laptop (13 in.) and desktop (23 in.) and do prefer in most cases to not use maximized windows by default, only maximizing when desired. So on both I've adjusted the valve to 80% (0.8) and find that works quite well and allows the reopening of unmaximised windows of a comfortable size. Agreed. Let's move to 75% and test that for a while. Why this bug is not marked as fix released on unity? The alpha2 bugs are not triaged yet, I'll set all the fix committed to fix released for now. Thanks! I've no issue with the 75%, and haven't seen many complaints concerning. Though a few netbook users who wish to maintain contact with the desktop have mentioned wishing the % was a bit higher. I would agree that this is a problem. Perhaps there ought to be an option somewhere for the user to establish the threshold for automaximize. The current value makes me crazy on my netbook... it adds numerous mouse-clicks before the screen is set to my liking and if ease of use is a desired feature of Unity, the current setup does not achieve that objective. Not being able to disable this feature is extremely frustrating to me. If I want something maximized *I* will maximize it, thankyouverymuch. This should have an on/off switch *and* a threshold slider somewhere, probably the Window Preferences panel. This feature also completely hoses fullscreen mode on some third-party games when they're set to fullscreen mode. Spiral Knights, for instance, starts up in full screen mode and gets "re-maximized," ending up with the game screen being in the wrong place with a window title bar it doesn't need. Some windows always startup maximized on 11.04 when they where closed while being very large. 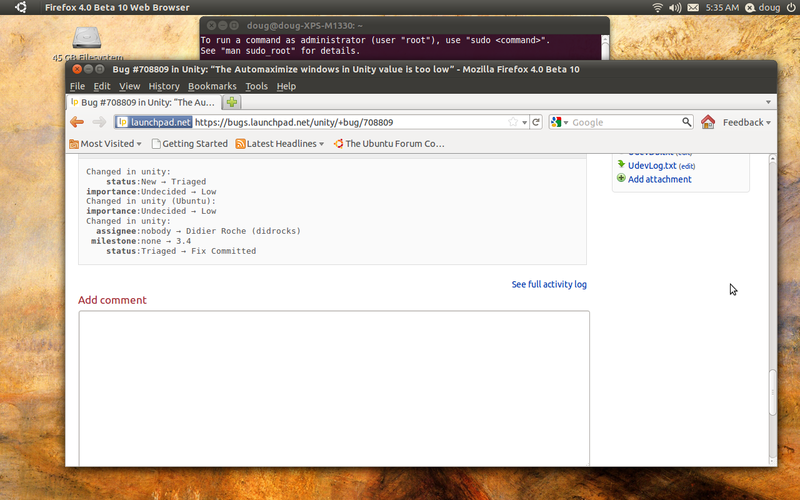 Open gedit and drag it to one of the sides so it resizes itself to the half of the screen. Something that is very usefull and often done. Then close gedit. Now reopen gedit. It will open fullscreen. Very irritating. Add option to disable auto-maximize. Not auto-maximizing might be better the default on desktops. On small screen laptops, this might be useful, but on multi-monitor setups with large screens, this is a no go. Why am I not allowed to customize this? I don't want my operating determining which windows are more important than others. >> Why am I not allowed to customize this? maybe because Ubuntu-11.04 is released and this feature was/is not a priority. > determining which windows are more important than others. > I've use unity on both a smaller laptop (13 in.) and desktop (23 in.) and do prefer in most cases to not use maximized windows by default, only maximizing when desired. > So on both I've adjusted the valve to 80% (0.8) and find that works quite well and allows the reopening of unmaximised windows of a comfortable size. The two bugs marked as a duplicate of this bug complain about the 75% value which was the "fix" here when I get it right. So they aren't duplicates I think. I'd like to register another vote for turning this option off completely, I find it hugely invasive to have it deciding for me how big is too big. @prokher, @hunter-w: with the lastest unity version (trunk), it's now possible to configure the automaximize value (see bug #754214). If it's set to 100%, only previously maximized windows will start maximized. can I verify that this trunk is legit? > set to 100%, only previously maximized windows will start maximized. I find this function intrusive and highly annoying as well. Will this fix be released to 11.04 updates, or will it show up in 11.10? I really hope it goes into 11.04, because it's a bug as far as i'm concerned. I find the automaximize "feature" very annoying too. The problem is that Unity tries to do something "smart" which in many cases isn't correct. 1. First, the user is surprised that the window is maximized because when he closed it, it wasn't maximized. This feels to him like a bug. 2. Second, when he realizes this is a feature, he is surprised because the automaximize happens only "sometimes". It's not obvious that the size of the window influences the automaximize feature. This is again perceived as a bug. 3. Third, there are cases when you don't want to have the window maximized for some reason (the application's window is used together with other windows and you want to see the other windows too) but it gets maximized every time you start the application. This is HIGHLY annoying. It feels like you don't have the control over the computer but the computer has control over you (my usual feeling from Windows). Moreover, I don't completely understand what this feature tries to achieve. Sure, on small monitors you want to start applications maximized but you have to do it only once - as windows remember their sizes, the application will always start maximized later on. I don't think the single press of the maximize button justifies the annoyance above. Conclusion: in my opinion, this feature shouldn't be on by default. Another vote for being able to disable this. It *can* be disabled in Unity-2D so for the moment I have been forced to use 2D as I find this 'feature' so annoying.